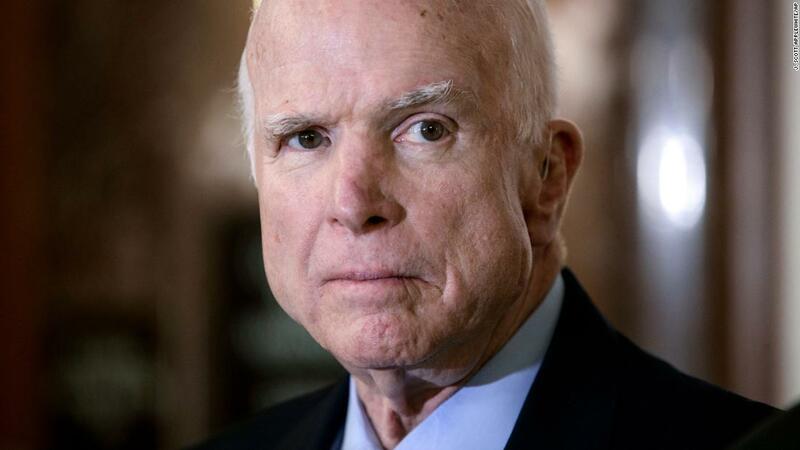 John McCain: The Senator of Arizona has died. He was 81. Career and Service: He was a Navy bomber pilot, prisoner of war, conservative outsider, Giant of the Senate and a twice-defeated presidential candidate. Joe Biden: "The world will miss John McCain"
In this File photo sen. John McCain (R-AZ) receives the Liberty Medal 2017 from former Vice President Joe Biden at the National Constitution Center on October 16, 2017 in Philadelphia, Pennsylvania. Former Vice President Joe Biden recalled his friend Senator John McCain, who had led a life of character, courage, integrity, and honor. Biden has said McCain took care of his son, Beau. Biden's son was also diagnosed with glioblastoma, an aggressive brain tumor . He died in 2015. "America will miss John McCain, the world will miss John McCain, and I'll miss him a lot," he said. "John McCain's Life is the Evidence That Some Truths Are Timeless Character, Courage, Integrity, Honor, A life that sustains these truths John McCain will cast a long shadow, his effect on America is not over, not even close, it will take many more years. "As a prisoner of war, John suffered the worst of what people do to each other can. In politics, he missed his greatest ambition In his life, he faced a cruel and ruthless illness, yet he never lost sight of what he most believed: Country First And the spirit that made him It was never extinguished: we are here to devote ourselves to something greater than ourselves. John was many things – a proud graduate of the Naval Academy, a Senate colleague, a political opponent. But for me, John was more than anything a friend. America will miss John McCain. The world will miss John McCain. And I will miss him very much . On behalf of me, Jill and the entire Biden family, we have our sincere condolences to Cindy, Doug, Andy, Sidney, Meghan, Jack, Jimmy, Bridget, and the entire McCain family. He recalled details of his ordeal in a Facebook message and a video with archival news and photos as well as memories of prisoners of war. When was he captured? 1967. He spent more than five years in the infamous detention center known as the Hanoi Hilton, where he was repeatedly tortured. He was released in March 1973. "Hard to believe that my A-4 Skyhawk was shot down over North Vietnam 50 years ago today," McCain wrote to the Facebook Post. "The great honor of my life has been to serve in the company of heroes in Vietnam whose camaraderie, bravery and resilience, in the face of tremendous difficulties, have inspired us to resist our abductors and find strength and hope even in the darkest hours." Sen. John McCain returned to Washington and made a dramatic vote to lift the Obamacare bill for the GOP, just 11 days after brain surgery. His vote came in the early hours of July 28th. Senate Majority Leader Mitch McConnell needed 50 votes. Senator Lisa Murkowski and Susan Collins had already voted against the so-called Skinny Reconnect bill. All eyes were on McCain, who instructed her to " watch the show". What happened next? McCain walked to the front of the chamber, raising his right arm and holding it in the air until he had the clerk's attention. "No," he said with a quick thumbs down. McCain later said that he rejected the bill because he believed the legislative process was flawed. George W. Bush Recalls John McCain as a "Man of Deep Conviction"
In this file photo, John McCain keeps his fingers crossed for the interview US President George W. Bush (R) in the White House Rose Garden on March 5, 2008 in Washington, DC. Former President George W. Bush described Senator John McCain in a statement tonight as "a man of deep conviction." "He was a civil servant in the best traditions of our country and for me he was a friend I miss very much," he said. Former President George HW Bush recalls the" outsider and warrior "
Former President George HW Bush has published a statement on Senator John McCain's death calling him a "patriot of the highest order, a civil servant of the rarest courage." "John McCain was a patriot of the highest order, a public servant of rare courage. Few sacrificed or contributed more to the well-being of his fellow citizens – and indeed freedom loves people all over the world.Another American outsider and warrior, General George Patton, once remarked: We should thank God for having lived like this men. I can do Johns Adding my gratitude to Mrs. Cindy, his wonderful family, and the people of Arizona who allowed this great and good man to serve with such distinction in the largest advisory body in the world. " World leaders accepted Twitter Share their condolences and remember the legacy of Senator John McCain. Canada's Prime Minister Justin Trudeau said McCain's sacrifice and public service had inspired millions of people. Australia's Prime Minister Scott Morrison described McCain as a "man of great courage and conviction". Israel's Ambassador to the United Nations Danny Danon mourned the loss of an "American hero". Gov. John Kasich named Senator John McCain "an iconic American hero, patriot and statesman of no comparison." Kasich, who shares a photo of himself with McCain alongside a statement in a tweet, said he "will miss his blunt speech and unfailing good humor." his unwavering determination and absolute dedication to the civil service. Vice President Mike Pence contacted John McCain's family on Twitter. "We honor his lifelong service to this nation in our military and in public life. His family and friends will be in our prayers, "said Pence. Dr. Kelli Ward, who fills the seat of Arizona Sen. Jeff Flake, said Senator John McCain's "decades of service will not be forgotten by the men and women of Arizona" seat.